Natural sunscreens are not as effective as their chemical counterparts. Less than 30 percent meet the skin protection factor given on the label. Natural sunscreen does not penetrate into the skin. They easily get rub off thereby does not protect the skin from sun damage. You may have been told a number of times that you should opt for natural products instead of the common over the counter solutions that contain chemicals, especially when it comes to skin care. Well, that’s true in all sense, but it may not be an effective option in case of natural sunscreens. Yes, if the claims of a recent study from Consumer Reports are to be believed, natural sunscreen may not be so effective in protecting your skin from sun damage. There is risk associated with using natural sunscreens you should know about. The researchers involved in the study conducted tests with around 104 lotions, sprays, sticks containing 30 or higher SPF. 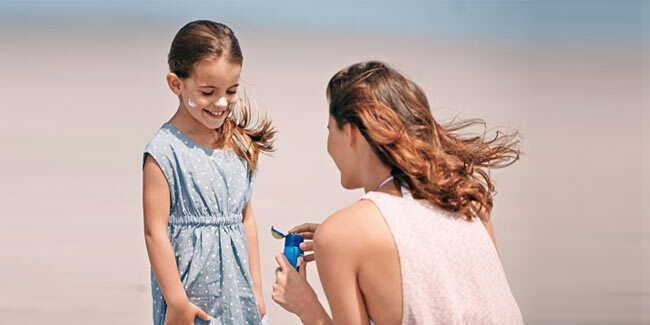 They found out that less than 30 percent of natural sunscreens were able to met the skin protection factor that they claimed about on the label of the product, which is way too less as compared to chemical sunscreens. When you apply natural sunscreen on the skin, it just sits over your skin instead of penetrating like the regular chemical sunscreens do, because of which it gets rub off easily, failing to protect your skin from sun damage. However, if you want to go for a mineral sunscreen you must use the only ones recommended by your dermatologist. Researchers suggest that one must always wear sunscreen before stepping out in the sun as it not only protects your skin against sun damage, tanning, and sunburn but also reduces the chances of getting skin cancer. Use sunscreen of at least 30 SPF. Always use shot glass sized amount of sunscreen. Keep reapplying sunscreen every couple of hours as long as you are out under the sun. Don’t overlook spots around the eyes, nose, the tops of the feet, lips and near the hairline and back of the leg. Important tip: Don’t completely rely on sunscreens as no sunscreen is known to block 100 percent of harmful UV rays. To make your sun protection shield more stronger, wear a hat, fully sleeves comfortable clothes, and a pair of sunscreen.